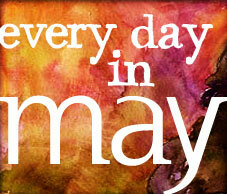 So here's my brand-new idea: I am committing myself to do a painting for every day in the month of May. They can be about anything I want. At the end of the month, a month that has a solid week of recitals and hours of driving time and packing up the kids to bring to my parents so the house can be perfectly quiet, I will have done 31 paintings. I may hate them all! I may have one I love, or I may think all of them are my best work yet. But I do know that I function better painting than when I'm NOT painting. And hopefully after 31 paintings I will learn something new. So...who wants to join me? NEW! I started a Flickr group here: Every Day In May. Go! Share your stuff! All artwork and content of this site copyright © Élena Nazzaro 1993-2010. Support your favorite artists and don't steal! ART, iNSPiRATiON, AND WHY LiFE iS LiKE FRENCH TOAST. Eight years of bloggy goodness.